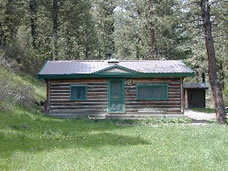 Located about 5 miles north of Canyon Ferry Reservoir, the Bar Gulch Cabin offers a retreat from the fast pace lifestyle. It is a small, one room cabin with a skylight, 2 bunk beds, and a full-sized bed. There are local businesses within driving vicinity of the cabin: marinas, restaurants, convenience stores, and watering holes. This cabin offers some primitive and rustic charms: a hand pump, a small antique cook stove, and wood heat. The cabin is located off Magpie Road #425. Access to the cabin is good but usually requires a 4-wheel drive vehicle in the winter. Open all year. $25/night fee. Potable water available. 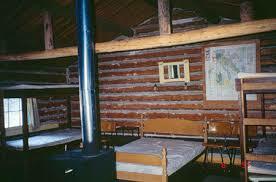 The Bar Gulch Cabin is situated in the Big Belt Mountain range. It is located 24 miles from Helena and 30 miles from Townsend, on the Magpie Road #425. From Helena: take the Canyon Ferry Road over the dam, and past Kim's Marina. Continuing east, watch for a left-hand turn onto Magpie Road. From this intersection, proceed up Magpie Road 3.9 miles where you'll turn left on Bar Gulch Road. Continue on this Bar Gulch road approximately 1/4 mile to the cabin, it will be to your left.